Water resources are critical to economic growth and social development. 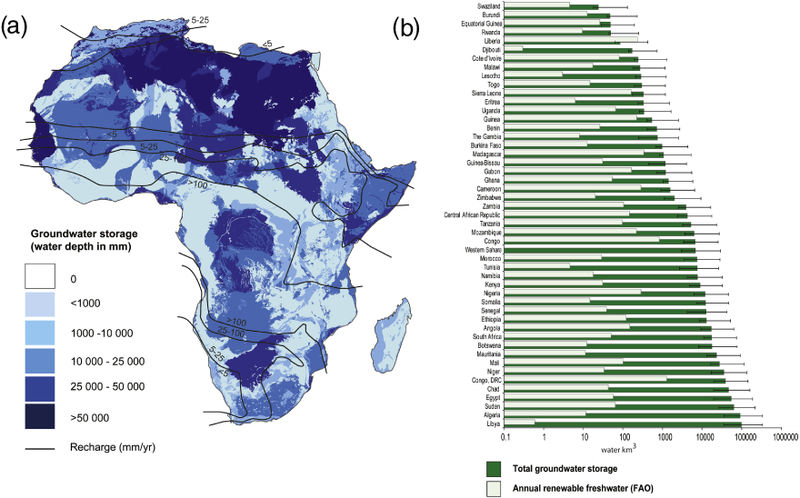 Groundwater provides most of the domestic water supply in parts of rural Africa and supports poverty reduction through access to clean drinking water and irrigation. In 2015, only 23 of the 52 countries in Sub-Saharan Africa (SSA) met the UN Millennium Development Goals target for drinking-water provision and Target 6.1 of the Sustainable Development Goals is to achieve universal access to safe, affordable water by 2030. Groundwater has the potential to provide an improved source of drinking water for those in SSA who are currently without access. It is also a relatively safe source of water for drinking and agriculture/livestock – it is naturally protected from contamination, so is generally of excellent quality and needs no treatment. Yet water is not only an important resource for the poor living in rural SSA, but is also central to most industries and a vital commodity for tourism. Industry is an important source of income for several African countries and a lack of water supply could constrain opportunities for development, including better services and improvements to poor people’s livelihoods. Groundwater sources are often resistant to drought, acting as a natural buffer against rainfall variability. However, groundwater is already intensively used in certain parts of Africa and in some cases it is being extracted faster than it can be replenished. As the population grows, water security in SSA will become increasingly important and demands on groundwater resources are likely to surge. To ensure sustainability, greater understanding of groundwater resources and how to manage their use effectively will be required. What is the state of the resource – quality and quantity – and how will it respond to abstraction, impact of growing population, climate change etc. ?